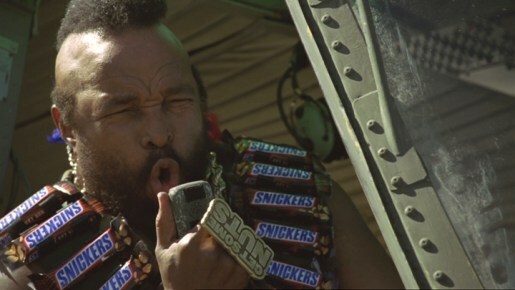 Mr T (Laurence Tureaud), famous for his role as Sergeant Bosco B A Baracus in the 1980s television series The A Team, is back in the third instalment of the Snickers “Get Some Nuts” television advertising campaign. The first two adverts, Soccer and Speed Walker, had Mr T turning up in a military tank and an armoured vehicle to challenge timid behaviour. This time he’s flying through the sky in a military helicopter, firing chocolate rounds into a swimming pool. A man prepares to swim in his pool but is put off by the temperature. But all changes when Mr T appears in a helicopter hovering over his house. “It’s time to get in the pool. You’re going swimming fool!”, he yells before unleashing a rapid fire volley of Snickers bars from his helicopter. Mr T appears alongside a speed walker (Kirby Heyborne) in this 2008 commercial and tells him he’s a disgrace to the man race before firing his Snickers bars. Mars pulled the ad after complaints from the US that this was an insult to gay people. The Get Some Nuts campaign was developed at AMV BBDO, London, by copywriter Mike Sutherland and art director Anthony Nelson, with agency producer Carol Powell. Filming for Pool and Speed Walker was shot by director Guy Manwaring via Sonny London and Therapy Films, with director of photography Fede Afonzo and producer Alice Grant. Editor was Mark Edinoff at The Quarry. Service production company in South Africa (Pool) was The Farm, Cape Town. Soccer was shot in Los Angeles by director Tom Kuntz via MJZ with producer Kate Leahy. Editor was Steve Gandolfi at Cut and Run. Sound was designed at Wave Studios, London. Post production was done at The Mill by producer Darren O’Kelly and Austen Humphries, colourist Paul Harrison, lead Flame artist Adam Grint, additional Flame artist Rich Betts, lead Assist Leon Woods, assists Gareth Brannan and Paul Wilmot, VFX supervisors Phil Crowe and Robert Kolbeins, supported by Paul Downes, Gareth Parr and Adam Lambert. Music is Theme from the A-Team, composed by Mike Post and Pete Carpenter, and performed by Daniel Caine Orchestra.